As the oldest of eight children, sixteen-year-old Lupita has a lot of responsibilities, but never resents it because her loving family takes care of each other, especially after moving to the United States from Mexico. Lupita excels in drama class, but suddenly her tears become easier to fake. Her mother has been diagnosed with cancer and her entire world has changed. While her beloved mother wastes away, her father becomes stressed over finances and Lupita has to raise a growing family that does not want to listen to her. She finds solace in writing poetry under the tenacious mesquite tree that grows in her mother's garden. I've been wanting to read Under the Mesquite ever since I saw it reviewed on Mrs. V's blog. I love novels in verse that are written from the perspective of someone from a different culture. (I'm also pretty excited that by the end of the year, I will probably be able to link to a different review for each word in that last sentence!) Author Guadalupe Garcia McCall is a teacher, which makes me even more excited to support her. We always make one another cry." Sometimes a little too hard." Many books in the "mothers with cancer" genre don't focus on the financial aspects of treatment. For Lupita's family, the repercussions are harsh and unending. My heart felt for the children as they begged food from family and friends. I need to have this book on my shelf for students who need the reassurance that others have made it through similar circumstances. 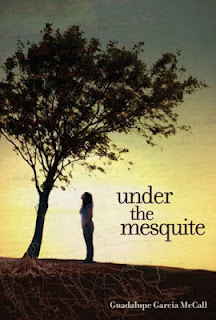 Under the Mesquite was worth the wait...check it out! Nice review! =) I read this months ago but am so behind on writing my reviews. Ahhhhhhh. I know that feeling. It's always nice when you have a chance to power through a bunch of reviews!